Written by Pippa Dowling when she was ten years old, Just Like Molly, is a sweet story about a little girl who has an imaginary friend called Molly. 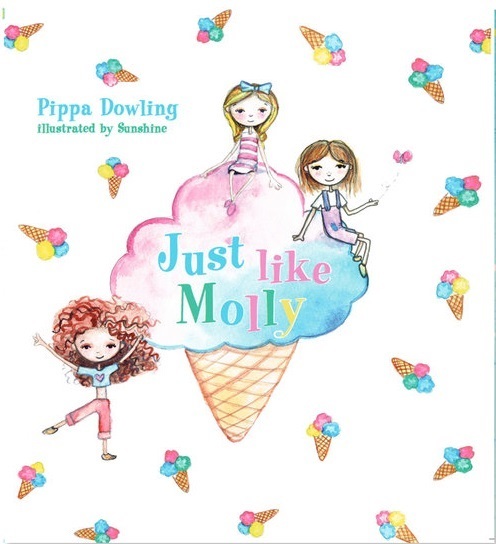 When the little girl starts at a brand new school, her friend Molly disappears and the little girl is left feeling very lonely and isolated. Things are bleak and sad, until the day another girl shares her crayons and the little girl discovers that her new friend likes many of the same things that she does, and in fact loves to do all the same things that she and Molly used to do together. The illustrations, by Melbourne based artist Sunshine, bring a sense of whimsy to the story, with the colour palette for each page reflecting the emotional state of the main character, beautiful bright colours when she is happy with her friend Molly, darker colours when she and Molly are scared, black and white when Molly disappears and eventually beautiful bright colours again when her new friend is made. This story is a lovely transition book for those little ones who are ready to let go of their imaginary friends, or for those who are leaving old friends behind and are nervous about starting at a new school and making new friends.